At Coast to Coast Realty, providing excellent service and making sure our customers are fully satisfied is our first priority. So please take a moment to read the following testimonials. I hope they indicate my experience and integrity, as well as make it clear how much I enjoy helping people with their real estate needs. A large percentage of my business stems from repeat clients who trust me and my associates. I would love to have the opportunity to show you what Coast to Coast can do for you as well. I would be happy to email you additional testimonials or provide you with recommendations if you are interested. 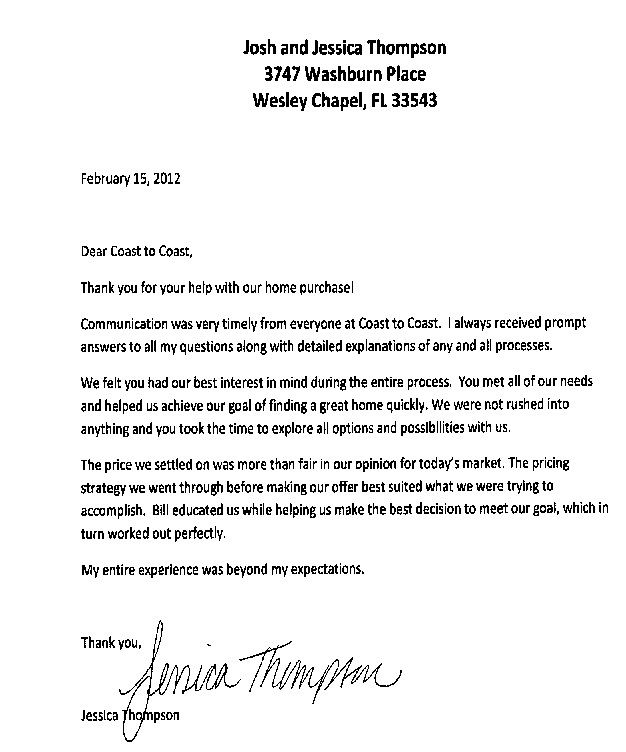 Hiring Coast-to-Coast Realty was the best decision we could possibly have made in the sale of our house! Not only did Bill guide us through an appropriate pricing strategy and position for our home, but he and Jade provided a level of service not seen with your average realtor… and we should know. We hired two realtors prior to Coast-to-Coast in an attempt to sell our home over the last 11 months. While other realtors each had the listing for several months, it took Coast-to-Coast only a few weeks to get us an offer – the first one in the entire time the house was on the market. I only wish we had listened to our friend about talking to Bill when we were hiring the second time around. Bill and Jade went above and beyond in providing communication, feedback and expediency in placing our home on the market, as well as in all aspects of marketing the property. While other realtors were telling us it would take two weeks to implement many of their marketing plans, Coast-to-Coast promised two days and actually delivered! Everything within their power was up and running within the proposed time frame. On top of that, the level of communication was incredible. I received more emails and updates online in a few weeks than I had received in the many previous months of listing the property with the other two agents combined. I definitely felt like I had insight into what activities were being performed at all times. 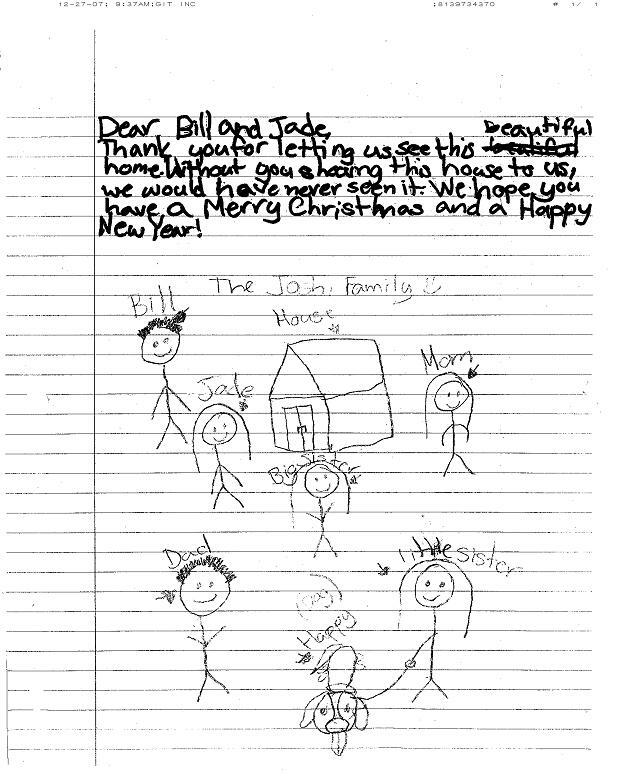 Bill and Jade, We want to Thank You for everything that you have done to make our dreams of Home Ownership come true. We are overwhelmed with your generosity. It is truly awesome the steps that you've taken to make every part of our journey much more relaxed and happy. The welcoming site of a Christmas tree added such warmth to an already exciting occasion of opening the doors to our new home. The children were elated that Santa had arrived before them into our living room. PV and I could not believe what a beautiful gesture of welcome that you made us feel. We wish you both all the luck and miracles that Christmas brings by and hope that your year will be filled with joy and prosperity. Happy Holidays to you and your families. Hi Bill and Jade, We just wanted to thank you for your professionalism, your integrity, (what you say is what you do), your helpfulness that was above and beyond most everyone. Your ability to keep things on track and moving. We would highly recommend the Coast to Coast Realty Team to anyone who would like a professional realty team that gets the job done (not a part time when I want to agent). Bill went above and beyond for me! It was a complete pleasure working with him. I was a first time home buyer and wasn't really sure what I truly wanted. I would tell him want I was looking for in a home and when he found exactly that, I changed my mind. He never once showed any sign of frustration with me. After time I felt that he really got an understanding on what I truly wanted. And he did, he found me the house with all the specifications i was looking for! perfect house for a first time home buyer! I felt comfortable at the closing table with Bill by my side, almost like a family member. I knew he was looking out for me! I honestly can't thank Bill and his staff enough! Buying a house was no walk in the park but Bill made it a lot easier!! Whether you are a buyer or seller, we would love to make you a lifetime client as well! Please give us a call if you (or someone you know) would like to find out more about how we can help!